The timing of development of understorey plants depends on the weather and on the type of forest they inhabit. 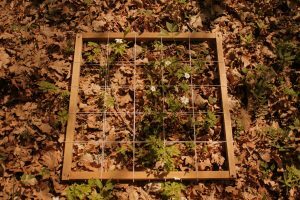 Monitoring their phenology tells us how the light conditions and habitat created by different canopy trees modify the plant community on the forest floor. 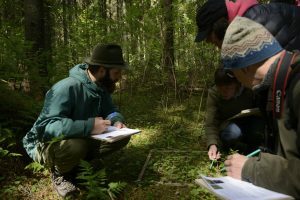 By creating a record of how and when the stages of development of flowering plants on the forest floor occur, we can better understand the niches created by different types of forest. Photosynthesis of plants in the understorey is influenced by the canopy tree species, their age and density. The forest trees affect the amount of light, its spectral composition, and the timing of canopy closure; but also things that we can’t immediately see like soil nutrients, pH, and moisture. The information that we take from the continuous monitoring provided by this Understorey Cover Activity allows us to better understand the differences in the environment created under various forest stands. This also tells us how well understorey plants can coordinate their phenology with insect pollinators and seed dispersers, and whether these process are likely to be affected by climate change in the future. Oxalis acetosella – It is a common forest species across Europe and common in ancient woodland. It is sensitive to transient changes in its environment, in that it is able to close its leaves quickly in response to these changes in e.g. temperature, moisture, light, using a hinge at the base of the stalk (petiole) that works by changing the pressure of water (pulvina). Insects pollinate Oxalis flowers in early spring, but later flowers are claistogamous (i.e. self-pollinating) and don’t open fully. Fragaria vesca – It is a ubiquitous forest understorey species found across Europe. Its flowers are also insect pollinated, and it makes runners (stolons) to vegetatively propagate through ramets. Some of its leaves remain green overwinter giving it an early start to growth in the spring (link to research on wintergreen leaves. Acting like scouts for the mother plant, signals about the surrounding environment can pass along these runners to and from ramets. Hepatica nobilis: – It is a spring flowering forest understorey species with a wide distribution. Like many ephemeral spring species its period of favourable light conditions is expected to shorten because of earlier flushing by canopy trees, but the impact of this changes may be counterbalanced by overwintering green leaves which allow it to photosynthesize sooner than other spring ephemerals. It produces blue flowers in the spring and seeds which are dispersed by ants.